"Chaya Can Stand Under my Umbrella"
Earlier in the week I had received a facebook message from an old friend of mine. She let me know that she would be in town for a couple of days while on a road-trip with her boyfriend and that she would love to meet up if I was available. My week was going to be pretty crazy, but I knew I could fit in a happy hour! There's always time for happy hour and friends who knew you before LA. Tessa, who currently lives in Portland, Oregon, has been one of my friends since high school and due to the reality of our lives we don't see each other very often, so I was really excited to see her and show her an LA happy hour! I suggested, La Poubelle Bistro, in Franklin Village. It was close to my apartment and I had been wanting to try their Brazilian Cosmo for awhile, one of their happy hour specialties. She thought it sounded great too! We arranged for a 7pm rendezvous. I walked in with a brown paper sack tucked under my arm and was greeted by Tessa and her boyfriend, David, who were already seated at the bar with wine in hand. "So sorry I'm a couple of minutes late!" I explained, but I had a good excuse. Don't you hate it when you keep going to the grocery store and you keep forgetting to buy the one crucial item that you actually need? Yeah, well, I kept forgetting toilet paper, so I thought before I took care of happy hour I should take care of my household needs...hence my worthwhile tardiness. It was hard deciding what to do first, catch up with my girl, or look at the menu. I managed to do both at the same time. Multi-tasking at it's best. I ordered the Brazilian Cosmo. 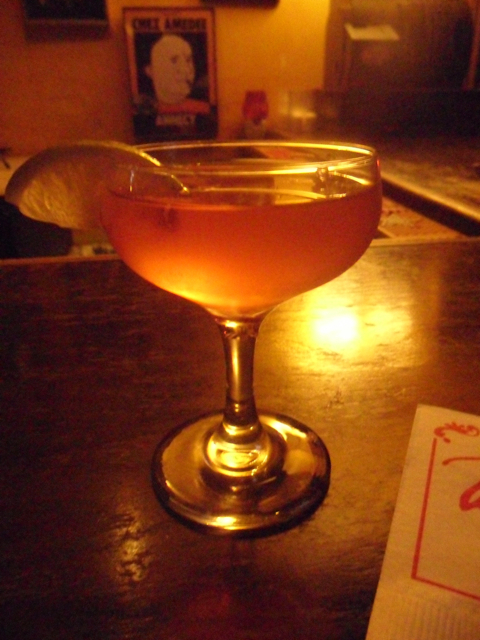 It's just like a regular cosmo, but made with the Brazilian liquor cachaca, which is made from fermented sugarcane. My muscles needed a drink oh so badly. I had been learning choreography all day for a short film I booked based on the start of Madonna's career. Yeah, by that time, I was one hungry Madonna too. Our food order was a group effort. We ordered the three fromage flatbread, hummus plate, and Mediterranean tacos. How funny, I thought, as I was telling Tessa about the project, that she is the very friend that I saw Madonna in concert with! I love how life catches up to itself in the most clever of ways. "Look at the guy!" Tessa exclaimed as the hummus plate was set down in front of us. "What guy?" David and I asked. "The guy on the plate, look at the arrangement!" We all laughed. It did look like a face made out of hummus and veggies. Very nice, La Poubelle! Shortly after, the guy was gone, but he was tasty. 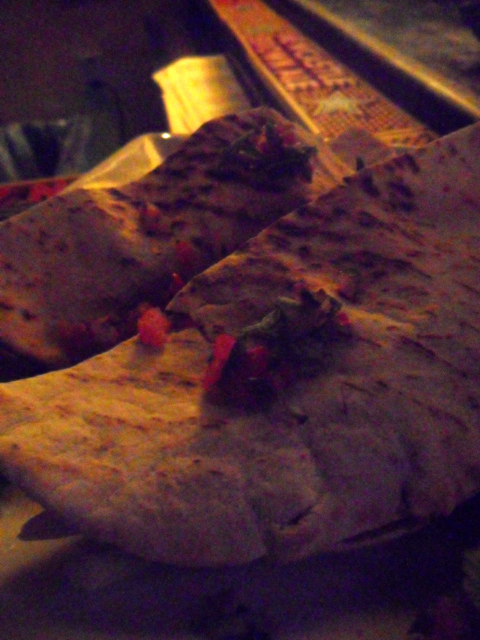 The flatbread was a very nice mix of cheeses bubbling up over a perfectly light and crispy crust. Lastly the tacos arrived. I wasn't sure what to expect since they were called "Mediterranean tacos." I thought they might be like a gyro. A-ha! Spicy grilled chicken with fresh pico de gallo all stuffed into a pita pocket. Got it. Good. I was really impressed with the flavor of the chicken. I think it had been marinated in spicy goodness for awhile. We all ate every bite! It was so great catching up with Tessa over a La Poubelle happy hour. The setting was great for talking and listening. It wasn't too loud, and at 7pm, not too crowded either. I wish far away friends came to visit more often, not that I need an excuse to find a happy hour...but it's nice to share my HH love with others who aren't around me all the time. Cheers!